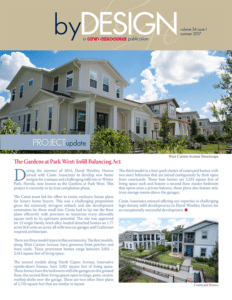 Home » byDESIGN Blog » Our Summer Newsletter is Here! Our Summer 2017 byDESIGN Newsletter is here! Click here to download the PDF version. We’re excited to share with you the latest edition of our byDESIGN newsletter. Inside you’ll find articles from our Urban Planning, Landscape Architecture, and Architecture studios about our latest projects and community involvement. Over 20,000 square feet of amenities frame magnificent lake views at Twin Lakes. Experience a refined upscale lifestyle built on local design vernacular at The Isles of Old Tampa Bay. We’ve updated our Houzz page! Check it out here. From all of us at Canin Associates, we hope that you’ve had a great first half of 2017 and that the rest of your summer goes well. We’ll be back this winter with more exciting company news. Stay cool out there!